The Reader (psychic or clairvoyant) is orange, which is a color designating psychic ability but she is a dirty orange as opposed to a bright orange. The Reader gives off an aura of different shades of blue, which represent some of the levels to which she is attuned. She cloaks herself in blue to make us believe that she comes in truth and light. Blue is a spiritual color but it does not carry as high a vibration as purple. The Reader is represented as a common person with some special gifts to attune to the non-physical reality. She has enough ability to make her credible. Her hair is like blue fire. It is in truth, ice. She is a cold person. She has no fire or warmth but only the coldness of ice blue. The Reader is detached from those whom she victimizes. I have exposed the Reader. She is naked. She has wedged herself into a corner thinking she cannot be pulled out. She will soon realize that I backed her into the corner so that she could be seen by all for what she is. 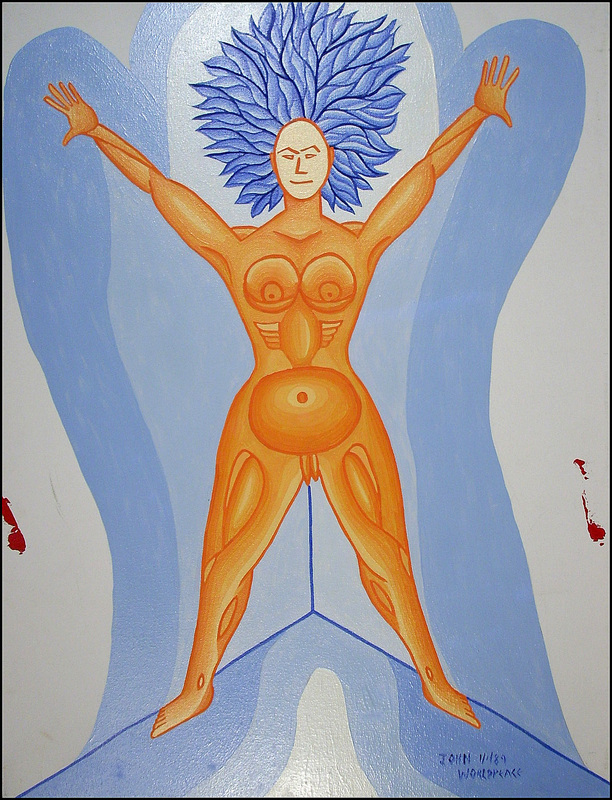 Her breasts, abdomen and womb form a mask that gives away the true nature of her being. The mask understands that it is on public display. Yet, its vehicle, the Reader, does not realize this. The eyes of the Reader are empty, meaning she can truly see nothing and she therefore has nothing to give. The blue aura is surrounded by raw canvas, which represents the earth and all that it contains: this is the arena in which The Reader operates. The red represents blood, symbolic of the pain and suffering that has been spilled by the Reader onto the earth. This is a weak Reader and the blood that she has spilled seems minor, yet that blood represents the pain and suffering caused by this Reader to hundreds of lives.